JJ is a 2-3 year old male Staffordshire Bull Terrier. Hey, sweet and loving ‘Jason Brown, aka J’ from 5ive here. Yes I may come across as little over excited sometimes but I have been in the entertainment business! Deep down a sensitive soul lies awaiting that true love to cherish me. I am quite a spiritual being, always looking for the best in people, even the Vet! A giddy, playful guy; that’s me! I’m a dab hand with a ball, ‘Slam Dunk Da Funk, put it up!’ Fear not ‘When the Lights go out’ I’ll be there keeping you warm, ‘Until the Time is Through’. I can’t wait to get into my forever home with that special adult of my own and that one to one care and attention without any other animals. JJ is 2-3 year old Staffordshire Bull Terrier who is Vaccinated, Neutered and Microchipped. 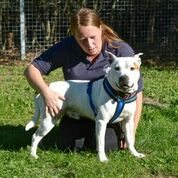 He would require an adult home without any other animals as he is very shy and not been treated kindly.